Google announced a new feature for Google Maps where they overlay public alerts on the map. 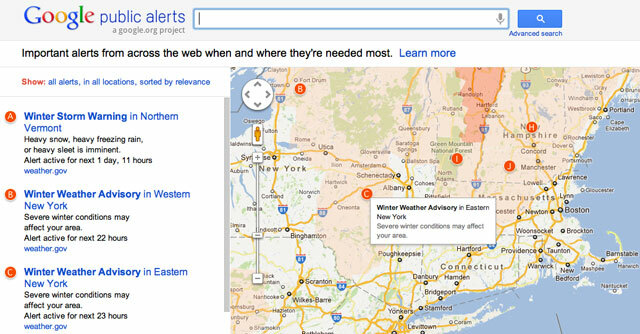 So now if there are public alerts, such as weather issues and other issues, Google will overlay them on the map. In addition, you can go to google.org/publicalerts to see any public alert happening now. 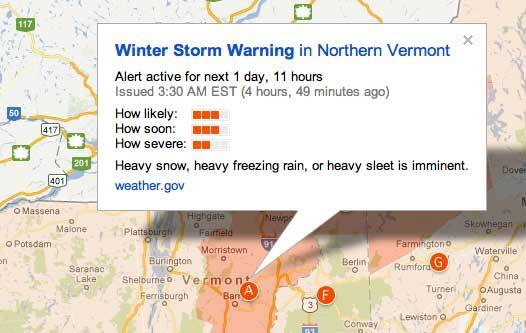 Clicking on the result will take you to a more detailed page, here is the awesome snow storm hitting Vermont. The data comes from US National Oceanic and Atmospheric Administration (NOAA), the National Weather Service, and the US Geological Survey (USGS). I'd like to give you a heads up about a new addition to Google maps called Google Public Alerts. Google Public Alerts is Google’s platform for disseminating emergency messages such as evacuation notices for hurricanes, and also everyday alerts such as storm warnings. It is a project of the Google Crisis Response team, supported by Google.org. On Google Maps, alerts will appear at the top of relevant search results and can be identified with a red target icon. Google Crisis Response has also set up the Google Public Alerts page where you can view all current alert information on a map. We hope Google Public Alerts provides the public with information they need to make better decisions in times of crisis, and ultimately help save lives. Please keep your eye out for Google Public Alerts on Google Maps. We would love to hear your feedback on relevancy and accuracy of the alerts we are displaying, as well as any other feedback you may have. You can provide direct feedback on Google Public Alerts via the feedback link on the Public Alerts homepage and on every alert details page. If you would like to learn more about Google Public Alerts please visit the FAQ and helpcenter or read the Lat Long Blog Post. Forum discussion at Google Maps Forum.